“The sequester” is an across-the-board spending cut designed in 2011 to force the Joint Select Committee on Deficit Reduction (“Supercommittee”) to agree on a broad deficit reduction package. Upon the failure of the Supercommittee, the sequester set into motion $109 billion of annual spending cuts each year from Fiscal Year 2013 (FY2013) through FY2021. The sequester cuts began in March of 2013 after being delayed two months by the fiscal cliff legislation (and having the FY2013 cut lessened by $24 billion). How Much Does the Sequester Save and From Where? From 2014 through 2023, the sequester and its extrapolated savings1 will cut primary spending by about $940 billion and interest by about $200 billion. The cuts are split evenly between defense and non-defense, and nearly nine-tenths of the savings come from discretionary appropriations. Most mandatory programs – including Social Security, Medicaid, food stamps, and veterans’ benefits – are exempt from sequestration. (A full list of exempt programs is available here.) Under sequestration, defense spending is cut by about 10% annually and most non-exempt non-defense spending by about 7%.2 Medicare provider and plan payments are reduced by only 2%. How Do the 2013 and the 2014 Sequester Differ and What Happens on January 15th? There are two main differences between the sequesters in 2013 and 2014. First of all, the 2014 sequester is about $30 billion larger, mainly as a result of the partial sequester relief this year in the American Taxpayer Relief Act (the “fiscal cliff deal”). Secondly, the 2013 sequester of discretionary programs was applied across-the-board, whereas the 2014 sequester offers some flexibility. Specifically, the reductions to discretionary spending for FY2014 and beyond, unlike in FY2013, take the form of lower statutory caps separately on defense and non-defense funding, giving appropriators the opportunity to set priorities within the topline limits. (Importantly, there is no additional flexibility on the mandatory side, where cuts to Medicare and other mandatory programs, which are already ongoing, continue unabated from FY 2013). What Happens to Discretionary Spending After 2014? Current law calls for the sequester caps to continue through 2021. Beyond 2014, spending levels will grow slowly over time at rate slightly below projected inflation, but will remain about $90 billion per year lower than the pre-sequester spending caps agreed to in 2011. After 2021, discretionary spending is not subject to any cap. How Much Would it Cost to Repeal the Sequester? How Does the Sequester Impact Our Federal Debt? 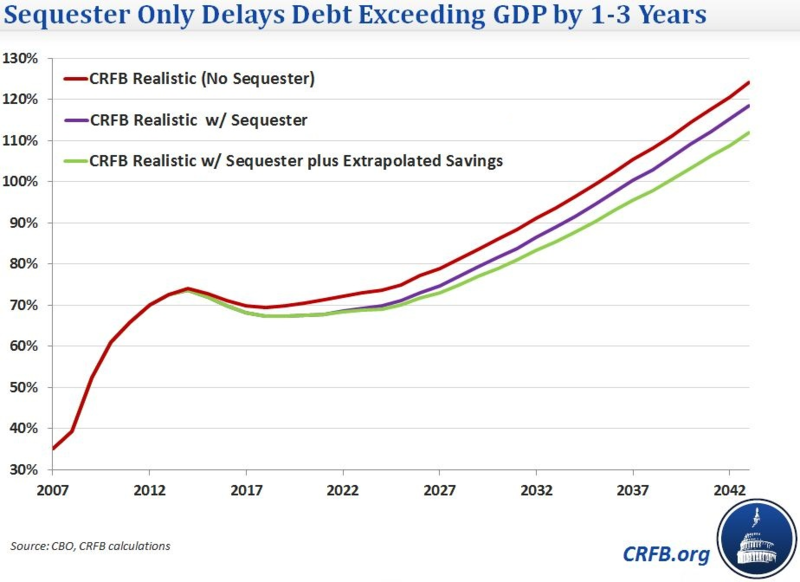 While the sequester is projected to reduce non-interest spending by a little over $800 billion through 2021 ($940 billion including extrapolated savings in 2022 and 2023), due to its temporary nature, the sequester will only delay debt reaching 100 percent of the size of economy by 3 years. And even that impact assumes that lawmakers will continue funding discretionary programs after 2021 based on the low sequester levels. Without that assumption, the sequester would have zero further impact on our long-term debt beyond a small impact on interest costs, evaporating just at the time when our debt problems become more severe. 1 Technically sequestration ends in 2021, but CBO assumes that future discretionary levels grow from 2021 levels, which leaves future levels below where they would have been without the sequester. 2 Technically, the magnitude of the annual percentage cuts to defense and non-Medicare non-defense programs declines each year from 2014-2021 as the amount of funding subject to sequester increases and the 2% cut to Medicare saves more money while the nominal size of the non-defense portion of the sequester cut stays the same. The cut to defense programs will decline from about 10% in 2014 to roughly 8.5% in 2021. Similarly, the cut to non-Medicare non-defense programs will shrink slowly from roughly 7% in 2014 to around 5% in 2021. 3 The FY2014 CR is at $986 rather than $988 billion because it discontinued funding for a few small items, the largest being a small piece of Hurricane Sandy funding. See http://crfb.org/blogs/understanding-numbers-surrounding-continuing-resolution-debate for more information. 4 This is largely because roughly $10 billion was shifted from non-defense to defense programs in 2013, compared to the original sequester-prescribed levels, when full-year appropriations were passed in March. 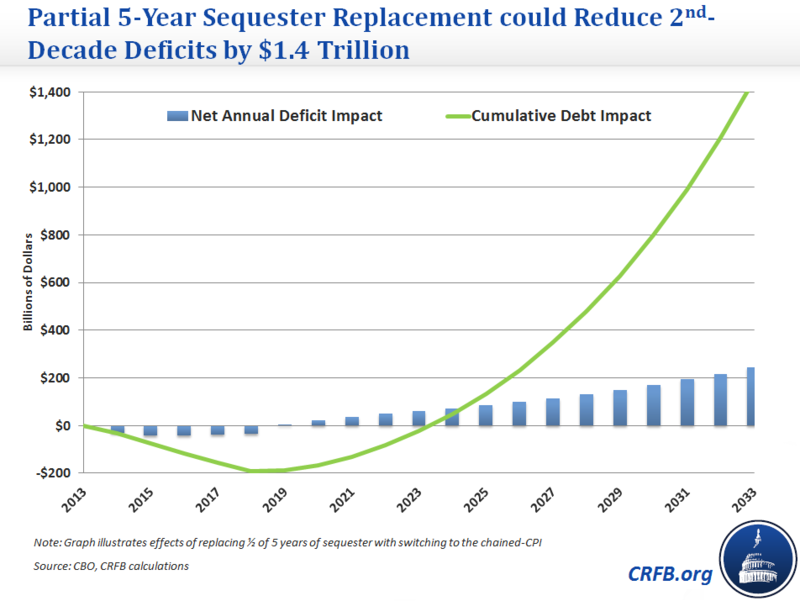 6 The $1.4 trillion figure would be the result of replacing half of the sequester for five years with a switch to the chained CPI, but many policies that produce permanent savings, particularly those that grow over time, would generate significant second decade savings in replacing sequestration.